The parish of Seething is situated in the south of Norfolk. It lies west of Mundham, east of Kirstead and south of Bergh Apton. The name Seething may derive from the Old English meaning ‘Place of Sitha’s people’. The parish has a long history and was certainly well established by the time of the Norman Conquest, its population, land ownership and productive resources being extensively detailed in the Domesday Book of 1086. Individuals named Stigand and Godwin held the land before 1066. However, after the Norman Conquest Walter of Dol claimed some of the land for Hedenham. The Domesday Book also mentions the presence of two churches and a mill in the parish during this period. 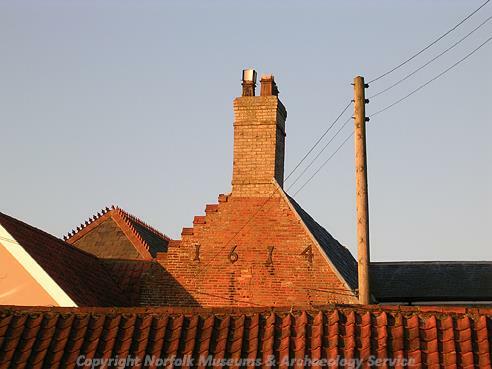 Modern Seething retains the charm of a traditional Norfolk village, and several buildings still have thatched roofs. The earliest site to have been found in Seething takes the form of a prehistoric pot boiler scatter (NHER 10440) to the northeast of Seething Hall (NHER 22084). A Palaeolithic flint axehead (NHER 19381) has also been recovered to the west of the Hall, so it is possible that this area was favourable for human activity during prehistory. In addition, two flint axeheads (NHER 10439 and 19380) from the subsequent Neolithic have also been recovered from the parish. Aerial photographs taken in 1933 identified the earthworks of three potential round barrows in Seething (NHER 10440, 10441 and 17699). However, more recent visits to the sites of the barrows have struggled to find any trace of them. This fact, when coupled with a lack of Bronze Age finds, makes it difficult to date and interpret these features. The same is true of the possible Bronze Age ring ditch (NHER 17698) southeast of Seething Old Hall. However, the concentration of features here might suggest some continuity of settlement and landscape usage from the Neolithic to Bronze Age. Very few Iron Age artefacts have been found in Seething. A single silver coin and several pottery sherds (NHER 40302) were retrieved from the same site, again near to the Hall. However, these comprise the entire assemblage of Iron Age artefacts, so it must be hoped that more items from this era are discovered in the future. The Roman period is represented by a few scattered objects, as no sites have currently been identified. A quernstone (NHER 19382) was found north of Dairy Lane and various pottery sherds (NHER 49804) and coins have also been retrieved. However, the most intriguing find was an intricate ‘fly brooch’ made from copper alloy (NHER 40302). During the Saxon period Seething had a church. The building is no longer standing but a monument resembling a huge church pinnacle set on a square brick base (NHER 10451) is located on the site. 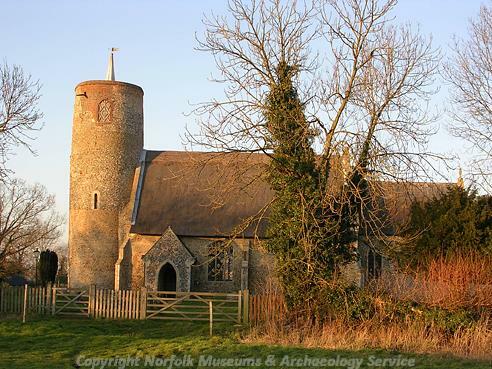 It has also been suggested that St Margaret’s and St Remigius’ Church (NHER 10444) has a Saxo-Norman tower, but the tower and fabric of this church are far more likely to be of solely medieval date. A number of fine Saxon period artefacts have been retrieved from various locations across the parish. Metal detecting recovered a Late Saxon convex disc brooch with relief decoration consisting of three inward facing cat-like animal heads (NHER 40523). An equally impressive find was a Late Saxon/early medieval knife handle with a dragonesque animal-head (NHER 40302). The other Saxon finds consisted of pottery sherds, including some identified as Late Saxon Thetford Ware (NHER 10445). Like most parishes, the most important features of medieval Seething are its church and its hall. As mentioned earlier, St Margaret’s and St Remigius’ Church (NHER 10444) originates in the Norman period. The church is notable for its thatched nave with windows dating to around 1300. Inside, there is a particularly finely carved font dating to around 1480 and there are numerous interesting medieval wall paintings. The Seething Hall of the medieval period (NHER 10433) seems to have been knocked down between 1797 and 1826. Investigations in 1996 discovered the remnants of a house platform and fishponds, but there is no other evidence to attest to the existence of this building. Earthworks and cropmarks relating to medieval agriculture have been identified on aerial photographs of the parish. The marks left by ridge and furrow (NHER 17700) can be seen on the village green to the sough of the church. Additionally, a livestock enclosure and associated boundary ditches (NHER 10442) have been found in close proximity to the ridge and furrow, with these features to the west of the church across Seething Street. A fairly typical selection of medieval artefacts has been recovered from Seething. These include a barrel padlock in the shape of a horse (NHER 49804), a looped harness fitting (NHER 49803), a lead seal matrix (NHER 29311), a bronze finger ring with empty oval bezel and a fine medieval conical lead weight with iron suspension loop (both NHER 29311). During the post medieval period, the mere would have been an attractive focal point in the village. Mere Farm (NHER 33252) is located here with its 17th/18th century timber-framed barn and 18th century brick farmhouse, which is notable for its elaborate Classical front door. Pond Farmhouse (NHER 34091) is also situated nearby, and takes the form of a high quality three-cell lobby entrance building with unusual ornate detailing. This particular farmhouse is a little earlier in date, of the mid 17th century. The final building to mention is White Lodge (NHER 45858) which stands opposite Pond Farmhouse. This brick-built 19th century abode has a three-cell plan and gable end chimneystacks. The grandest building erected in this period was Seething Hall (NHER 22084). Sadly, this mansion was derelict by 2002 but it was originally the service or stable wing of a vanished building dating to around 1700. The present building is of around 1800, altered in 19th century. It is set in fine parkland which contains an 18th century coach house. A limited selection of post medieval artefacts have been recovered from the parish. Amongst these finds were sherds of stoneware pottery (NHER 16477), six harness mounts (NHER 29311) and part of an elaborate spur (NHER 40302). The most recent archaeological record relates to World War Two. During this period Seething had an airfield (NHER 10466) that was initially used by USAAF bombers before later becoming a key RAF site. Interestingly, part of the airfield was also used as a German Prisoner of War camp. The restored control tower here now houses a memorial museum. Thomas Sunley (NLA) 16 May 2007.